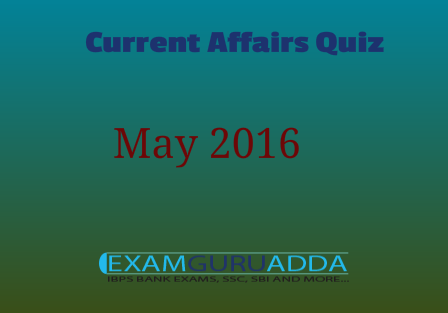 Dear Readers Examguruadda.in presents Current Affairs quiz of 17th May and 18th May 2016 that cover important current affair events. Current Affairs quiz prepared according to the latest Bank, SSC and other competitive exams. 1. Which Bank has launched SmartUp for start-ups? 2. What is the strike range of Prithvi-II missile ? 3. Who won Intel Foundation Young Scientist Award? 4. Who won the third prize in UN Poster for Peace contest presented by the UN Office for Disarmament Affairs (ODA) to raise awareness of the need for nuclear disarmament? 5. Who won Spanish league title La Liga? 6. Which state has decided to launch Green Passage scheme for orphan students to ensure that they get free of cost higher education in the state? 7. World’s largest Single Rooftop Solar Power Plant inaugurated at which place ? 8. Who was awarded Othmer Gold Medal for Entrepreneurial Leadership? 9. Who has won the 2016 Man Booker International Prize for her novel ‘The Vegetarian’ ? 10. Which Bank has decided to close its retail banking branches in a phased manner?